The Bosch Tassimo Vivy is affordable coffee capsule machine that is basic but easy to use and makes great coffee. See also: The 11 BEST Coffee Machines of 2017. 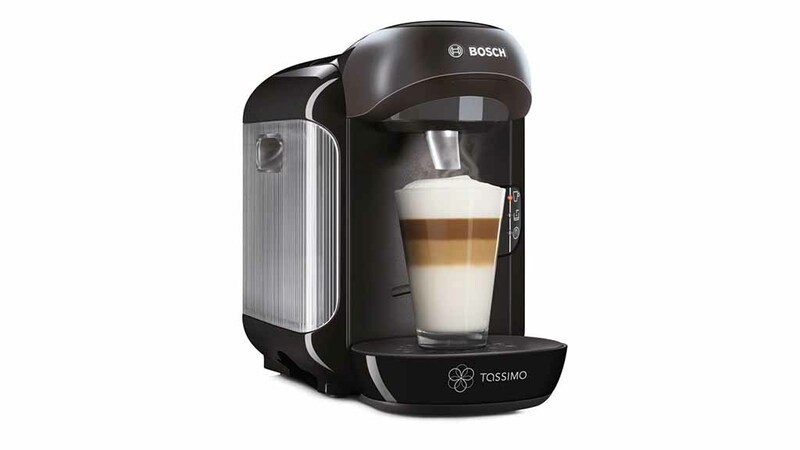 If you’re looking for an easy-to-use, basic coffee capsule machine, the Bosch Tassimo Vivy is for you. Affordable and compact, this unit does what it says on the tin, but not much more. One of the most attractive features of the Bosch Tassimo Vivy is its size. With measurements of 10 cm x 10 cm x 10 cm this unit takes up very little bench space. Its sleek, modern design and availability of seven different colours mean this coffee machine is a great addition to any kitchen. However, its compact design is also one of its biggest downfalls. Due to the small water tank at the back, users will often find the red low water light blinking and need to fill it up with water every two or three drinks. But this is one of the sacrifices to be made if you are looking for a small, unobtrusive machine. See also Nespresso Krups Prodigio review. Also, don’t open the box expecting a weighty, solid, stainless steel unit. Somewhat echoed by its low price-point, the Vivy is almost wholly plastic. This means it is relatively flimsy. Its price also means there is no feature for steaming milk. The Bosch Tassimo Vivy couldn’t be any easier to use. One capsule, one button and you’re off. From opening the box, it will take minutes to set up. Another great feature is the speed in which it heats up the water. Compared to other machines of its size or price, the Tassimo Vivy takes next to no time to heat the water. Even better, the Tassimo Vivy has an automatic cleaning and descaling program and is made up of dishwasher proof parts. As with all coffee capsule machines, much of the taste of the finished product depends on the coffee pods you are using. With the Bosch Tassimo Vivy however, this is probably more important due to the low water pressure the machine can muster. However Tassimo does produce a vast range of different coffee capsule – or disks as it calls them – to suit everyone’s tastes, and the Vivy unit pours a smooth cup with a respectable crema. See also: The BEST capsule coffee machines of 2017. While the heat of a hot drink varies from person to person, if you do like your beverages at an expected temperature, the Bosch Tassimo Vivy might not deliver. It doesn’t look like Bosch put much time or effort into ensuring the water strains through the disks at a good hot drink temperature, and you could find yourself needing to zap it in the microwave for a few extra seconds. There is no doubt the Bosch Tassimo Vivy is extremely good value for money. Priced at just £37.99 it is one of the best affordable coffee capsule machines on the market. The Tassimo disks are not too bad either, averaging at an average price of 50p each. See also: Best De’Longhi Coffee Machine.